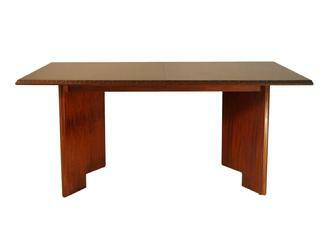 Rectangular dining table, top over a double “V” base, Taliesin design to edges. with two original 16” leaves with conforming Taliesin molding detail. Extremely sturdy. Excellent original condition with rich finish and 50 year patina; shows restrained use. Minor color touch up to corners and usual edge dings; two slight scratches, with macro photos available upon request. Small (1" or less) repair to base. Signed with script signature. This table is stamped underneath "5510," indicating a production date of 1955, and perhaps table #10 of the production run.